Each day anew, Rietje Geurts finds the way from her heart to her sculptures. The ever-so visible human emotions in her bronze sculptures continue to inspire. People recognise in her work the commitments that they themselves have made to humankind. The personal bond that Rietje has with each sculpture continues, because she must make each subsequent version almost from scratch. She patiently sculpts her images back to life with wax. Her consistent use of wax sometimes brings her to the limits of what is possible with the soft, pliable substance. Diva is one such sculpture whose proportions did not lend itself well to working with wax. But no matter; she loves creating, loves working on her sculptures. Locking yourself in the studio, starting from nothing, until you see a figure emerge from the first forms, becoming inspired by an idea, discovering a connection. 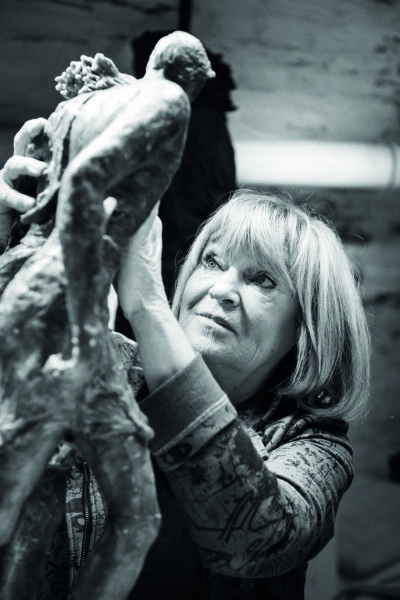 The language of the bronze sculptures of Rietje Geurts is recognised by all. Despite the pressure that surrounds us today, thankfully we remain open to this universal message.